From analysis of customer data and targeted strategic planning right through to operative implementation and adjustment – Campaign provides all the relevant marketing and recurring communication services under one roof. You have the support of a powerful partner with us. Guaranteed. One2one customer communication is our speciality. That’s why customers from a huge range of industries have been placing their trust in us for 24 years. Worldwide. The management around Managing Director Daniel Augsten introduces itself. Check out their portraits to see who they are and what makes them stand out. 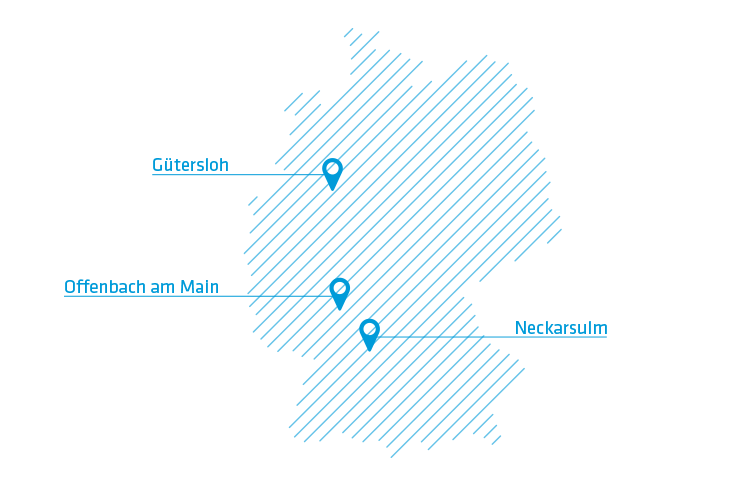 Three locations, one strategy – our nationwide network in Germany offers flexibility, the best service and top quality for our customers. Consistently high quality is the only way to achieve success. That’s why we’re dedicated to continuously improving our work processes and products. We take responsibility – for environmentally friendly production and compliance with social and economic regulations. For a sustainable future. Our employees are our lifeblood: thanks to them, we are able to offer our customers excellent service – every day. We shadowed our colleagues to bring you their stories.